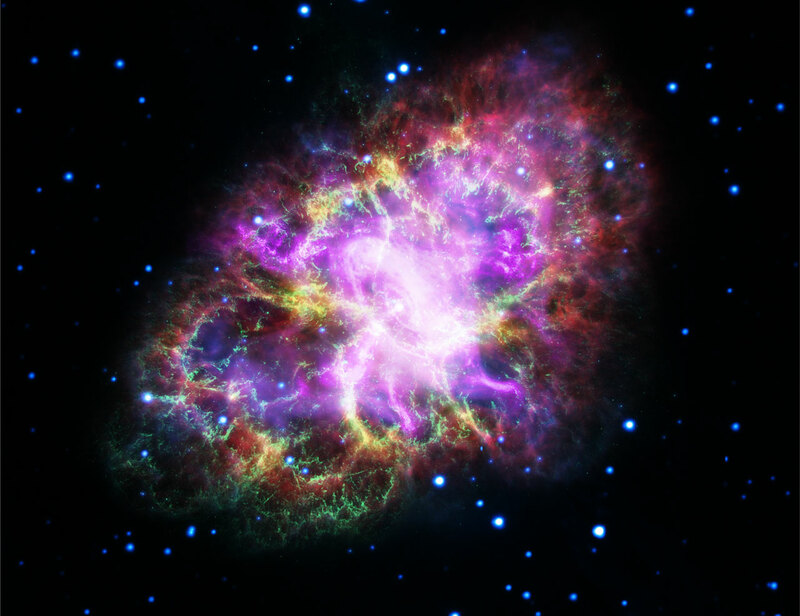 The Crab Nebula is cataloged as M1, the first object on Charles Messier's famous list of things which are not comets. In fact, the Crab is now known to be a supernova remnant, expanding debris from massive star's death explosion, witnessed on planet Earth in 1054 AD. This brave new image offers a 21st century view of the Crab Nebula by presenting image data from across the electromagnetic spectrum as wavelengths of visible light. From space, Chandra (X-ray) XMM-Newton (ultraviolet), Hubble (visible), and Spitzer (infrared), data are in purple, blue, green, and yellow hues. From the ground, Very Large Array radio wavelength data is in shown in red. One of the most exotic objects known to modern astronomers, the Crab Pulsar, a neutron star spinning 30 times a second, is the bright spot near picture center. Like a cosmic dynamo, this collapsed remnant of the stellar core powers the Crab's emission across the electromagnetic spectrum. Spanning about 12 light-years, the Crab Nebula is 6,500 light-years away in the constellation Taurus.